AutoPlay Media Studio 8 includes 21 built-in object types. Objects are the basic building blocks that make your application unique. They are what your user interacts with in order to make your application do something. The great thing about objects in AutoPlay Media Studio, is that they are already ‘smart’. You simply drop them onto a page (or dialog) and then edit their ‘properties’ and ‘events’ to customize them however you want. You’ll be able to layout your graphic user interface as fast as you can drag and drop! This category of objects is the backbone of AutoPlay Media Studio. They let you make graphically-rich software applications. You won’t find this level of customization for interactive interface objects in other development tools without putting in a lot of effort and elbow-grease! 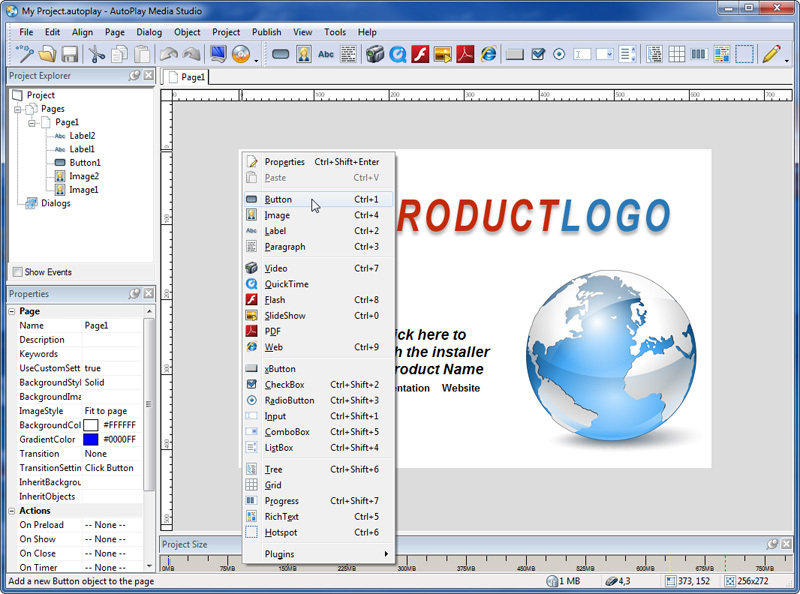 AutoPlay Media Studio 8 is a complete visual software-programming environment. Use it to rapidly create full-featured software applications for use on Microsoft’s Windows operating system. A button responds automatically by changing its appearance when you move the mouse over it or click on it. With multiple image states (fully customizable transparent PNG graphics! ), text options and a toggle state, buttons are used for many interactive tasks. We include a variety of pre-made button files for you to use, as well as a full featured button editor for making your own. They can be any shape or size you want! Get creative. Perfect for headlines and single line sentences, text label objects support interactive design-time resizing, custom fonts, sizes, colors, sound effects and more. An advanced anti-alias algorithm eliminates jagged edges and makes all of your text look great – even at large sizes. Use any font, size, color or style of text you want. The software handles the required logic to automatically embed the TrueType fonts you use so your projects look great on any system. Add text effects like bold, italic and underline, set alignment options and pick from a variety of scroll bar skins. The Paragraph object in AutoPlay Media Studio 8 has been updated to default to Windows 7 style scrollbars. This will give any of your scrolling textboxes a much more up-to-date visual appearance. Of course, you can still make your own scrollbar styles from scratch or choose from old favorites such as Chrome, Euro, Corporate, Charcoal, Industrial and more. This is a very popular category of objects – and for good reason. You’ll use these objects to show movies, play music, display websites, show documents and more, all from within your application! The web browser object lets you display a web site right on your page, just like it would appear in Internet Explorer. Easily create custom web browsers by responding to a comprehensive set of events.The web object now uses the latest Microsoft Internet Explorer SDK. New scrollbar and border options have been added to give you increased visual control over the object – allowing you to better integrate web pages into your AutoPlay Media Studio applications. It’s an extremely powerful feature! The bread and butter of the graphical user interface. You’ll come back to these over and over again. They’re extremely useful for both getting data and displaying data. If you’re trying to create an application that blends in beautifully with the operating system, the new xButton object is just what the doctor ordered. However, that’s just the beginning! The new xButton object supports far more customization than was previously possible. Now you can modernize your applications by adding “icon” images to your buttons, plus you can “markup” the text however you desire! This object lets you control the relative placement of button text and button images; choose between normal and toggle styles; adjust fonts and colors; and even markup you text using dozens of XAML tags – including hyperlinks right on your buttons! By default, the xButton styles itself according to whatever operating system it is being run on. If your application is running on Vista, the button looks like a standard Vista button. If you’re running it on Windows 7, it looks like Windows 7. However, you can easily override this and choose from many included styles like Flat, Office 2000, Office XP or many different Office 2007 styles. Or hundreds of MSSTYLES themes… The options are endless. The checkbox object wraps the standard Windows checkbox control but takes it to a new level by allowing transparent background and mouse state text color changes. The radio button object is great for quiz and test applications. Radio buttons support transparent backgrounds and changing text color as the mouse passes over them. Radio button selection and grouping is also handled automatically. Create forms and other information collection systems. Supports single and multi-line input boxes, as well as password masking, custom input masks and a variety of customization options. When you want to present a list of options, but need to do it in a compact and efficient manner, this object shows a dropdown list box. You can control the look and feel of the object with properties such as font face, text color, size and background color. Show a scrollable list of information, allowing single or multi-selections. For example, you could display a list of song titles (so the user could choose a song to play), or a list of topics (so the user could decide what topic to view next). Includes options for text style, colors, auto-sorting and more. Checkbox lists are a long awaited addition to AutoPlay Media Studio! We’ve integrated this feature into the existing Listbox object – you just need to turn it on. Once you do, you can easily present lists of items with corresponding checkboxes. Actions are included to get and set the checkbox state for any listbox item with ease. You’ll find dozens of great uses for this one! The ‘not-so-common’ user interface controls that really add enhanced functionality to your application. In other software development tools, you’d have to work pretty hard to get this level of usability into your software. With AutoPlay Media Studio, you just drop them onto your page or dialog! The tree object allows you to display a hierarchal list of items on the page in the well known tree format. Items can have checkboxes associated with them, or simply be selectable. The tree object has an extensive action set so you can load and manipulate tree items at run time for full flexibility. Working with data grids in AutoPlay Media Studio is more useful than ever, especially with the new integrated database features in v8. As always, the grid object allows you to add spreadsheets, grids and list controls to your applications. With over 110 scriptable actions, it is extremely powerful. To help you easily preload data, you can now even specify a CSV (comma separated value) data file at design time. Whether you need to show a percentage of a completed task, or a simple indicator gauge to keep your users informed, the progress bar is ideal. You can control the background and bar colors, text, fonts, vertical or horizontal orientation, step size, min and max values, and a variety of styles such as standard or XP look. Now also takes on the look of the operating system or the application skin in v8! The rich text object allows you to display rich text (.rtf) in an object. It supports background transparency as well as design-time and runtime character and paragraph formatting. Make any part of your background image “live”. The hotspot objects add flexibility to your projects by making background design elements interactive. More Objects! Add Object Plugins and Go! Object Plugins are one of the best features of AutoPlay Media Studio. They allow 3rd party software developers to extend and expand the product in an extremely integrated and seamless fashion. By simply dropping a plugin into your project, you can easily save yourself hours of work and add significant functionality to your application. The great news is that with AutoPlay Media Studio 8, plugin developers can now fully leverage the advantages of the Lua 5.1 language. The Plugin SDK v2 is available for free download on the indigorose.com website in the forums.